Our college has excellent infrastructure for sports and games with one of the best athletic grounds. 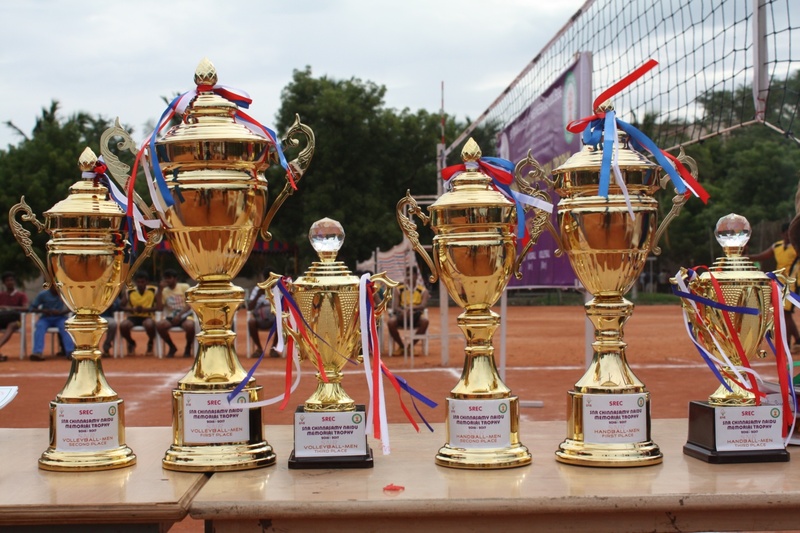 Our facility includes 4 Ball badminton Courts, Basketball Concrete Court, Football Field, Handball Court, 4 Volleyball Courts, 400 Meters Athletic Track. 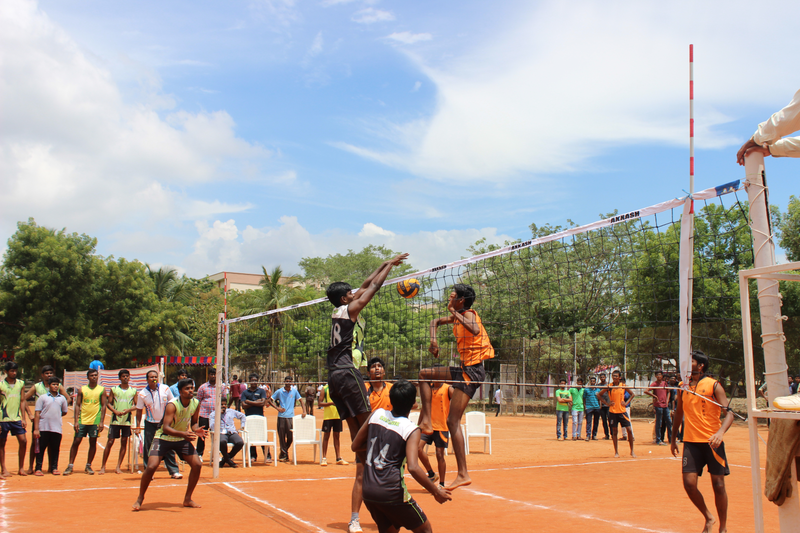 Sri Ramakrishna Engineering College has excellent infrastructure for sports and games. Presently SREC has facilities for the following outdoor games. SNR CHINNASAMY NAIDU MEMORIAL Trophy is instituted for the students in Inter Engineering Collegiate Tournament.SNR RANGASAMY NAIDU MEMORIAL Trophy is instituted for the Inter Engineering Collegiate Staff Ball badminton Team. The following players of our college were selected to represent Anna University Chennai in various disciplines at the South Zone and All India inter University Tournaments organized by Association of Indian Universities. The following player of our college have been selected to represent Anna University Chennai teams in various disciplines at the Tamil Nadu Inter University tournaments organized by Sports Development Authority of Tamil Nadu in the Academic Year : 2015 - 2016. The following team players of our college have been bringing laurels to our institution by winning medals in the South Zone Inter University tournament for the year 2014-2015. P.Saranya of Final year ECE, participated in the 35th National games WUSHU held at Tiruvendram, Kerala from 31.01.2015 to 14.02.2015 organized by Indian Olympic Association. G. Arthi of III ECE, participated in in the National women sports Gymnastic competitions organized by Mission Directorate – Rajiv Gandhi Khel Abhiyan, Ministry of Youth Affairs & Sports, Government of India held at Jharkhand, Ranchi from 19.02.2015 to 22.02.2015. This year our college has organized Anna University Chennai, Zone-11, Inter Collegiate Handball (Men) and Ball badminton (Men), in our campus. The SREC Alumni Football rolling Trophy for men and Throw ball rolling Trophy for women was jointly organized by the Department of Physical Education and Alumni Cell for the year 2014-15. The SREC young India cricket tournament was jointly organized by the Department of Physical Education and Young India Association for the year 2014-15. In our college totally 38 staff members are participated in various tournaments organized by various institutions. Good evening to one and all present here, the honorable chief guest of today’s function Ms.LATHA SUNDARAM, Managing Trustee, Aram Foundation, Coimbatore. Sri R.Vijaykumhar, Managing Trustee, S.N.R Sons Charitable Trust, DR.A.EbenezerJeyakumar, Director(Academic), Dr.N.R.Alamelu, Principal, Deans, Heads of the various Departments, faculty members and my dear Students. It gives me immense Pleasure in presenting a brief annual report of Physical Education department. The following player of our college were selected to represent Anna University Chennai at the South Zone and All India Inter University Tournaments organized by Association of Indian Universities. G.PRANESH of III Civil secured second place in south zone Inter University and secured third place in All India Inter University Handball tournaments held at Periyar University ,Salem for the year 2016-17. The following students of our college were selected to represent Anna university Chennai in various disciplines at the South Zone Inter University organized by Association of Indian Universities. Anna University, Chennai Conducted Various Sports and Games for the year 2016-17, in various disciplines. Our college student R.NARENDRAKUMAR of IV EEE represented for FENCING Competition for the year 2016-17, organized by Kumaraguru College of Technology, Coimbatore, on 21 &22.12.16 won the SECOND PLACE. Anna University, Chennai Conducted Various Sports and Games for the year 2016-17, in various disciplines. In these tournaments our college totally 243 students are participated and brought laurels to our institution by winning various medals. SNR Chinnasamy Naidu Memorial Trophy was instituted during the academic year 2012-2013 by the management and events were conducted in various disciplines. Nearly 600 players participated from 19 various engineering colleges with great enthusiasm. In this year our college students Participated and brought laurels to our institution by winning various medals in the above said tournament. Coimbatore Erode Nilgiris and Tirupur Inter Engineering Sports were organized by Erode Builders Education Institute of Engineering and Technology, PSG College of Technology, Coimbatore Institute of Technology, Sri Shakthi Institute of Engineering and Technology and United Institute of Technology, Coimbatore. In these tournaments our college students participated and brought laurels to our institution by winning various medals. Our college student R.KAVIYA (1405032) of III IT secured SECOND PLACE in the CENTIES 2017 (Coimbatore Erode Nilgris Tirupur Inter Engineering Sports), Athletics - Discus Throw held at Coimbatore Institute of Technology, Coimbatore on 05.03.2017. Our college student N.SUBHASHRI of IV CSE represented Inter National Level Yoga Championship 2016, organized by Yoga cultural society (regd) affiliated to All India yoga cultural federation AYUSH –Govt.of India & Ozone Yoga centre held at Sri Iyyappa Matriculation Hr Sec School Sholinganallur Chennai on 04.12.16 Secured FIRST PLACE . Our college student N.SUBHASHRI of IV CSE represented XIX National Level Yoga Competition, held at Kathir College of Engineering on 05.11.16 & 06.11.16 won the FIRST PLACE. PATRICK EBENEZER of I CIVIL represented State Level Swimming Competition, held at Mahatma Gandhi Stadium, Salem, on 20.08.16 & 21.08.16 won the SECOND PLACE (50 mts Butterfly & 4x50 mts Relay). Our college (Men) Volleyball and (Women) Throw ball teams secured First place and Basketball (Men) and Football (Men) secured Third place in the KICS-16 held at Kumara guru College of Technology, Coimbatore from 11.08.2016 to15.08.2016. Our college Football (Men) secured Second place in the KARUNYA – ADONY ACADEMY SPORTS FEST held at Karunya University, Coimbatore on 19.08.2016 & 20.08.2016. Our college Handball (Men) secured Third place in the RIVIERA 2017 held at Vellore Institute of Technology, Vellore on 28.01.2017 & 29.01.2017. Our college Chess (Men) secured First place in the COIMBATORE VIZHA 2017 held at Sri Ramakrishna Engineering College, Coimbatore on 04.02.2017. Our college Ball Badminton (Women) and Football (Men) teams secured First place, Volleyball (Men) secured Second Place and Basketball (Men) secured Third place in the 6th CHINNASAMY MEMORIAL TROPHY held at Adithya Institute of Technology, Coimbatore from 16.02.2017 to17.02.2017. SNRCNT Ball Badminton (Women), Handball (Men) and Volleyball (Men) tournament was organized for the year 2016-17 at our college campus from 28.07.2016 to 30.07.2016. AZAADI 70 Foot ball (Men) tournament was organized for the year 2016-17 at our college campus on 17.08.2016. AUSB Zone XI Ball Badminton Women tournament was organized for the year 2016-17 at our college campus on 22.08.2016. AUSB Zone XI Ball Badminton Men tournament was organized for the year 2016-17 at our college campus on 30.08.2016 & 31.08.2016. 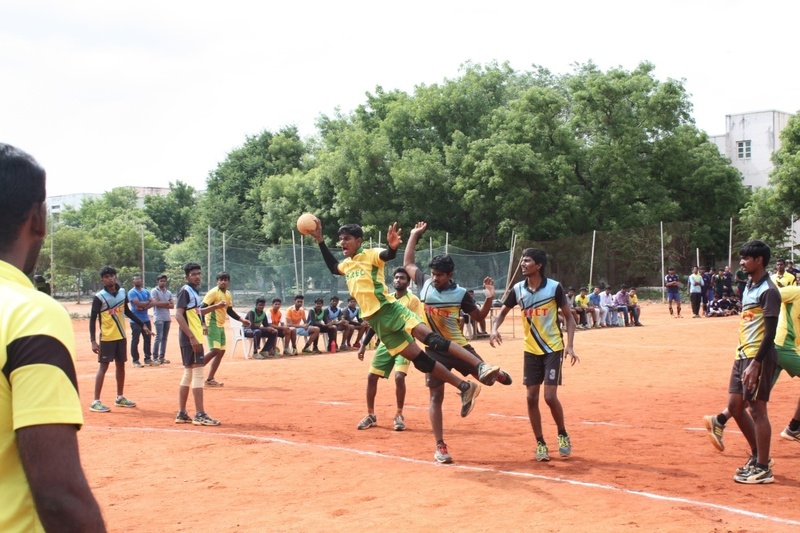 Coimbatore School District level Ball Badminton, Handball, Volleyball and Kho-Kho Tournaments for boys and Girls were organized at our college campus from 05.10.2016 to 09.10.2016. Coimbatore Vizha Chess Inter Engineering Tournament was jointly organized by the Department of Physical Education and Young Indian Association on 04.02.2017 at our college campus. The 13thS.N.Rangaswamy Naidu Rolling Trophy Inter engineering College Staff Ball Badminton Tournament (Men) was organized by our college on 07th January 2017. Our college Staff Cricket team secured SECOND PLACE in the Staff Men T20 Cricket tournament organized by United Institute of Technology for the year 2016-17. Our college Staff Ball Badminton team secured THIRD PLACE in the Staff S N Rangaswamy Naidu Rolling Trophy organized by Sri Ramakrishna Engineering College for the year 2016-17. S.SARAN RAJ, II EIE, won the First Place in the KambuAdiPadam and Stick Fighting, Second Place in the SurulVallVeechuand Third Place in the NedungkambuVeechu in the 12thNationalSilambam Championship 2015-2016, held at Kings College of Engineering from 05.02.2016 to 07.02.2016. Our college student of G. Arthi IV ECE, got selection to participate in the National women sports Gymnastic competition organized by Mission Directorate – Rajiv Gandhi KhelAbhiyan, Ministry of Youth Affairs & Sports, Government of India held at Hyderabad, Telangana from 09 .02.2016 to 12.02.2016. SNRCNT Ball Badminton (Women), Basketball (Men), Handball (Men) and Volleyball (Men) tournament was organized for the year 2015-16 at our college campus. This year our college has organized Anna University Chennai, Zone-11, Inter Collegiate Ball badminton (Women), in our campus. The SREC young India Football tournament was jointly organized by the Department of Physical Education and Young India Association for the year 2015-16. The 12thS.N.Rangaswamy Naidu Rolling Trophy Inter engineering College Staff Ball Badminton Tournament (Men) was organized by our college on 2ndJanuary 2016. Four teams from various Engineering Colleges participated with great enthusiasm. P.S.G.College of Technology, Coimbatore secured the winners position, the Runners-up position was bagged by staff members of Sri Ramakrishna Engineering College, Coimbatore , Third place was secured by Karpagam College of Engineering, Coimbatore and Sri Ramakrishna Institute of Technology, Coimbatore, was secured fourth place. Intramural tournament 2015-16 was organized for both men & women. The students were classified into four houses, namely Red, Yellow, Blue, and Green.